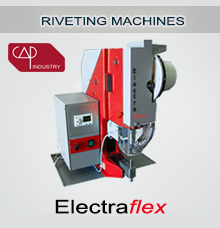 Electraflex is a new product of the ELECTRA family of riveting machines from Capmac Industry. It's the answer to the market request of a product: low cost, fast and reliable. Powered by an electric engine, these riveting machines are equipped with an automated rivets feeder for rivets with head diameter from 3 to 20 mm. 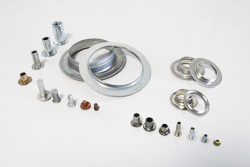 flex is a synonymous of flexibility: these machines can easily updated thanks to the interchangeable rivets feeder,which allows to feed solid, tubular, semi-tubular rivets, and rivet nuts. 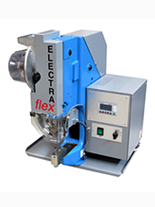 Extraordinary compactness makes Electraflex extremely ergonomic, easy to use and low maintenance. The level of safety is a key factor for all ELECTRA family; their system doesn't allow to start the riveting cycle if the "protection fingers" is not in position, to guarantee to 100% the safety of the operator. Electrical engine means no oil, no gas, no noise, no dusty! This is another important aspect which helps the protection of the health of workers and prevent the pollution of the environment. Be simple. Be green. Beflex! 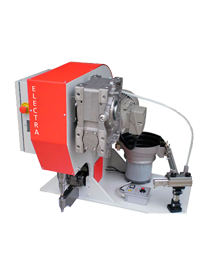 Electra is the new riveting machine produced by Capmac Industry. Designed to be simple to install, simple to use, simple to adjust and simple to maintain. Cheaper because simple; is the synthesis of all the experience Capmac Industry technicians have had in producing riveting machines. Just one regulation, commands closes to the fingertips, riveting cycle fully controlled by the PLC, extraordinary compactness makes Electra an extremely ergonomic and easy to use. The level of safety is a key factor for Electra; their safety system doesn't allow to start the riveting cycle if the "protection fingers" is not in position, to guarantee to 100% the safety of the operator. Electra is powered by an electrical engine. No oil, gas, noise, to protect both operator and environment. All of this without forgetting the functions of a modern riveting machine: automated rivet feeding, fast cycle, quality riveting, operator safety, low maintenance, EC compliant. 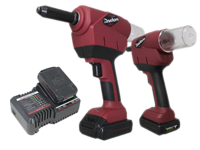 Electra is produced in two versions, for solid rivets and tubular rivets. *Electra PR for auto-piercing with solid rivets. Click here for PR technology..